So I was sent an article on godandscience.org that supposedly proves god using science and I, the magical and egotistical Peter, am here to refute the claims that are made on this beloved site! I will most likely be referencing other posts I make so be prepared. The page itself is broken up into sections and I will refute them in order. Introduction: This makes a few false claims but there is nothing here that needs correcting. Excess quarks: The basis of this argument is that the masses of the quarks in the universe must be finely tuned to allow matter to exist and that somehow proves god. I have a few things to say on this. 1: String theory is beginning to provide a framework for why the elementary particles have the masses that they do so it is ludicrous to assume that they are fine tuned. What would we see if the masses were not "just right" and we did not exist? What would we see if the quarks and anti-quarks annihilated themselves and all we had was pure energy? What would we see if we were not here? We would see nothing! This is key because, regardless of how small the probability is of the masses lining up just right, it must have happened at least once in the past because we are here to study the amazing coincidence! This answer is more probable then saying "God dun it!" because, with the previous statement we are asserting that there is a massively more complex god that then must be accounted for and that violates Occam's razor. Here we are using a simple logical premise whereas in the case of god we are asserting an even more complex watchmaker to make a watch that could have occurred merely by chance. 3: The next point I would like to make is that we do not know the possible ranges allowed for the mass of the quark (at least to my knowledge). This is also key because it means we cannot make a fair probability judgment because we do not know all the possible outcomes. 4: The up and coming multiverse theory makes this point moot since there are, according to the many theories, an infinite or very large number of universes which means that there is either a guaranteed shot of us being here or a very good shot. Here one could ask, what evidence is there of the multiverse? And to that I say, BAM! Point 1 and Point 2. Granted, we do not know for certain but, at least according to the evidence right now, it seems there may be a multiverse and if M-Theory is correct there most certainly is. Large, just right sized universe: The point that is being made here is that if the universe were bigger or smaller we would not be alive. I will be addressing this in order. Smaller: What is claimed here is that if the universe were smaller than the universe would not have undergone nucleosynthesis and we would only have hydrogen. To prove this the author cites the Wikipedia page on Big Bang Nucleosynthesis but if one actually reads the page it makes no mention of what would happen if the universe were smaller, in fact, it only uses the word once and this is talking about Helium-4. But even so, the things that caused it were density and heat that means that if the universe were smaller, the heat ratio could be offset and it would still occur. The same thing applies to it being bigger. So basically, we have a link to a Wikipedia page that doesn't even prove your point. "The rate of expansion of the universe [in the inflationary model] would automatically become very close to the critical rate determined by the energy density of the universe. This could then explain why the rate of expansion is still so close to the critical rate, without having to assume that the initial rate of expansion of the universe was very carefully chosen." A thing that can be added to both points: If there is a multiverse, which there is evidence for as shown above, this too is moot. Also, the anthropic argument can be applied to this meaning that regardless of how small the probability is of the density being just right, it must have happened at least once. Early evolution of the universe: The basic argument here is that the universe must have evolved a certain way to contain matter and life and that proves god. (?) We can also apply the anthropic principle to this as well. But again, if the multiverse does exist this too is moot. The evidence that is cited only talks about matter in our universe, it makes no mention of matter in other universes. Just right laws of physics: The argument here is that the constants are just right for life but I, and many others, have refuted this point in depth. I wrote a post entitled Debunking the fine tuning argument which shows why this argument is false. Universal Probability Bounds: This really makes no argument but just talks about the most improbable thing that could happen and I feel no need to comment on this. What do cosmologists say: This too makes no real argument but what I have to say is that in 1998 only 7% of the members of the National Academy of Sciences who returned a poll (about 50%) said they believe in god whereas 72.2% said they did not. I think this speaks for itself. Speculative "solutions" to the design "problem": The basis of this is that the only alternative is the multiverse theory but that there is no evidence for it thus it is invalid. This is not true seeing as if one looks above I give evidence for the multiverse. Granted, it may not exist but it is still much more elegant and simple than an all knowing, all powerful cosmic sky daddy. Must point out that the scientific evidence for a multiverse is incredibly feeble, and also even if said multiverse existed an we had a guarenteed shot of existance you must also relize a "god" would have to exist because eventually a "god" would be created too. I think this site really does spew untruths and attempts to convince people with them. I agree that the evidence for the multiverse isn't great but there is evidence nonetheless and it works with some of the most modern theories of grand unification. You say that God would be created but I disagree, God by his very nature is outside the normal existence, outside the universe (or in this case the multiverse). You missed the point of most of the articles completely. They never even attempted to prove t God exists, they only attempted to show the errors in the theories they addressed. You wrote the accusation that the author of the site "spew[s] untruths and attempts to convince people with them" after you had done just what you accused him of. Wow. Whether God exists, according to Peter, is determined by popularity poll. Using terms like "sky god" shows objectivity. Wow 50%+ 72.2%=122.2% you must be an English major. It's pretty clearly Anonymous who's not an English major, since they lack basic reading comprehension. "in 1998 only 7% of the members of the National Academy of Sciences who returned a poll (about 50%) said they believe in god whereas 72.2% said they did not"
This means that 1) a poll of NAS members was taken 2) only half of the members answered the poll 3) 7% of those who did answer believe in god 4) 72.2% of those who did answer do not believe in god. I just read these comments again and all I have to say is: lol. Remaining completely objective here, basing off of the Big Bang Theory and the idea of it beginning from a singularity, what would have caused the singularity or the parameters for which it could exist? Are we to assume that this environment (of which a singularity could form) has always just been in existence? Where is the start point? Well first let me preface with this: I haven't argued this position or read about it in years and so this reply may be subpar, but I will answer. I would say that the question of "when did the singularity start" makes no sense considering out of the singularity (if there can even be a physical object, or lack thereof) came space-time. The question of "when" presupposes that there was time before the big bang which isn't the case. Your quotation from Hawking actually answers the point because it is saying that sans the big bang there was no time ergo questions of "creation" and "duration of existence" don't make sense. I realize this is a really old post :), but I'm just trying to understand this position. Even taking the "time before the big bang" out of the equation, I am still left to wonder. Just starting with the beginning of space-time, what caused it? For every effect there is a cause, unless we are outside of space-time, then it is presumed to "just have been" (in terms of before space-time), which is where I believe this argument (hypothesis) leads. So if things exist outside of space-time, then the possibilities are limitless and cannot be defined, therefore the idea of God is just as credible as anything. Oh boy, my writing was very sub par back then. But to your reply: you see, the question of "cause" makes no sense in a universe without time. For cause and effect are definitionally temporal actions and without sense of time, there can be no cause and no effect simply because the time aspect isn't there. While it's hard to imagine, I hope this analogy can shed some light - in some alternate world humans have no conception of speed - that is, humans are not aware that distance/time = speed, they simply have no measure for it (like we have no way to measure things in higher dimensions - and you show up and ask someone how fast they were driving. Going off their understanding of the world, that question makes no sense. Granted, it's not a perfect analogy, but I hope you see the point I'm making. Trying to talk about a time before time is like trying to measure something that has no length. He argues, if memory serves, that pre-time quantum fluctuations can create universes. Arguably, if you want to get into this discussion, we can. But that is a whole different rabbit hole. Precisely! Before the actually expansion of the singularity, there was no space-time ergo there is not a cause for every effect. So if one looks at the expansion of the singularity as an effect, it wouldn't need a cause (as per your statement). But here is where you make an interesting argument which I actually address in a separate post. You say "So if things exist outside of space-time, then the possibilities are limitless and cannot be defined, therefore the idea of God is just as credible as anything." I wrote this post a while back that kinda touches on what you're saying (http://petersaysstuff.blogspot.com/2011/02/god-before-time-why-not-universe-before.html) but I do want to add something else. While technically the idea of god can have merit, it isn't inherently as credible as anything else. That statement presupposes that all hypotheses are equal which simply isn't the case. There were other theories to explain the expansion of the universe and the data we see now contradicted them and thus they were tossed out. So if data observed today and our understanding of science today supports X theory, then that theory is more credible than the god hypothesis. If the god hypothesis is equally credible to anything, it would be equally credible to the satirical claim that the flying spaghetti monster created all that exists. Unless there are data supporting the claims, they are at the bottom of the barrel credibility wise and, potentially, fall pray to the fallacy of unfalsifiablity. This discussion is very interesting! My conclusion here is that science in general seems much too "sure" about these things. I am definitely able to grasp the idea that cause and effect do not exist outside of space-time, and able to grasp the idea of "outside of space-time". This intrigues me most. If we are to assume space-time began at the Big Bang, it seems impossible to be sure of anything that happened before then, because it has no observational consequences. The one thing I feel we can be certain of is that there was an existence before the Big Bang, that most likely continues to exist outside of space-time, since what we "know" of "outside of space-time" there is no beginning or end simply because there is no time. The only reason, therefore, that all hypotheses are not equal (on this matter), is because only one can be true. What that one truth is, or is not, is impossible for science to determine because it exists in an environment of no observational consequences and can neither be proven nor disproven. It is indeed! It's bringing back memories. Science is very unsure about the ultimate make up of the universe. That's why you have people trying to reconcile quantum mechanics and general relativity which contradict but both explain things amazingly well. There are theories for the beginning in both camps. 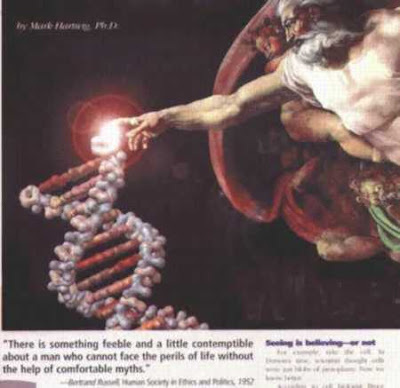 But science tends to lean away from the god hypothesis because it is not verifiable. >If we are to assume space-time began at the Big Bang, it seems impossible to be sure of anything that happened before then, because it has no observational consequences. Of course. Also, "before" makes no sense in the context of a thing where space-time doesn't exist. But yes, that is why Hawking said what you quoted earlier. What makes you certain about this? >The only reason, therefore, that all hypotheses are not equal (on this matter), is because only one can be true. That is not correct. The reason all hypotheses are not equal is because some are unverifiable. The Judeo-Christian god is said to have tangible effects on the universe yet we see no evidence of that. Evidence we see in the cosmic background radiation is consistent with a big bang-inflationary period. When you are presented with a hypothesis that IS falsifiable - that is, can be proven wrong - and one that is NOT, then they are not equal. It's like comparing apples to oranges. >What that one truth is, or is not, is impossible for science to determine because it exists in an environment of no observational consequences and can neither be proven nor disproven. Very debatable. While the actual "truth" pre-big bang (so to speak) may have no consequences, the mechanics behind it would still apply. For example, quantum fluctuations can be measured today and, if the math works out and it's shown that there is a possibility they can create inflationary bubbles that break through our own fabric of space-time, then there is a piece of evidence that leads to larger proofs. When it comes to pre-big bang, nothing is truly verifiable. Just because something is not scientifically verifiable doesn’t inherently reduce its likelihood of existence though. Based on the current Inflationary Universe theory, it is most correct to believe that the entire universe spawned from nothingness and evolved to what we know today. To me “pre-big bang” makes perfect sense, if we are to agree that space-time began at the big bang. For something to begin means it was not so before it began. To me, this means that if there was no “before” space-time, space-time and the universe as we know it would have had to have spawned from nothingness. To me, this lends itself even more to a creation, because what in our universe can spawn from absolutely nothing? If it cannot spawn from nothing, it must have been created. Just as a “for fun” example, our universe could exist inside of a greater existence. Just to use this as an analogy - Think of a computer program existing inside of our universe, with the person controlling the program as its creator. Our universe’s law of physics don’t necessarily dictate the law of physics inside the computer program, so the creator can make the program do whatever it needs to do while the creator exists outside of the computer program’s space-time and cannot be scientifically verified by the AI inhabitants of the computer program. – Of course this is a silly example, but something we can relate to. The big bang inflationary period is not being disputed, it is mutually agreeable in this discussion. We see no tangible evidence of God that can be scientifically recorded today, but according to ancient texts, people throughout history may beg to differ. People today claim that they can feel God working in them, but this of course is not scientifically verifiable. Yet, I do not know of any scientific study that irrevocably disproved God. In fact, I do not know of any scientific study that has irrevocably disproven anything pre-big bang, so that would mean that none are falsifiable, and none are provable – so in fact they are all equal in probability, but only one can be true. Interestingly, when comparing all pre-big bang hypotheses, God has a prominent “edge” over other pre-big bang hypotheses solely because of so many claims by people throughout history. In my mind, this gives God a higher probability than other pre-big bang hypotheses, because while none of the pre-big bang hypotheses are neither provable nor falsifiable, God is the only one with prominence among people from the beginning of written history. From a knowledge gathering standpoint, yes it does. Unverifiable hypothesis are useless. >Based on the current Inflationary Universe theory, it is most correct to believe that the entire universe spawned from nothingness and evolved to what we know today. Correct, but our understand of quantum mechanics is adding to that view. QM is suggesting that there is the ability for something to come from nothing. >For something to begin means it was not so before it began. This is only true in our current conception of time. But absent time, or even viewing time through a different lens, this isn't inherently so. Paragraph two: this is contradictory. You state that there is no "before" space-time and you concede that space-time began with the big bang, but you then say that the big bang must have been created. This doesn't make sense because creation implies a temporal difference - that is, nothing at X point in time and then something at Y point in time. You cannot have your cake and eat it too - either there is no "before" the big bang and thus questions of what "created" it are probably useless, or there is time before it and then we have a whole different issues on our hands. >Just as a “for fun” example, our universe could exist inside of a greater existence. Paragraph three: while this analogy is a great one, it doesn't jive with the "no 'before' space-time" framework you established right before. What's more, if one buys this view, which is M-Theory, then the laws of quantum mechanics apply and there is a ton of evidence that quantum fluctuations in energy levels can create stuff from nothing (I suggest you look at the books I linked). Then the question is settled. It doesn't matter what ancients thought about god. Newton was an alchemist but we reject alchemy even though the ancients believed that because there's no evidence. if there's no evidence for god then there is no reason to believe in him. As you said, this is not provable which means John Doe's claim of "feeling the genie in the corner" is just as valid. While you are correct in the first part, your claim that they are equal is flawed. You concede that there is no evidence for god today which means that there is no reason to believe he exists thus the provability status pre-big bang doesn't matter in a world where you concede there's no evidence for his existence. Does that make sense? Basically you said god doesn't exist. This means nothing. The ancients believed in tons of things but that doesn't make them true. What's more, even if it did, AT BEST, it proves a deistic view, not a particular religious view. Basically, it doesn't matter if ancients believed in god, that doesn't give his theory any more weight. It just means people back then wanted answers. The ancients didn't know about chemistry and thus made up alchemy but we know that's false. According to your logic, alchemy should be more widely accepted because people believed in it first. Additionally, the point at which you concede there's no evidence for god then this discussion doesn't matter. If there's no evidence, there's no reason to believe it. It's that simple. First, while I said it's very likely impossible to "prove" God exists by scientific standards or even find empirical evidence, I never said that God doesn't exist. This is apparently where our viewpoints differ vastly. While (it sounds like) you must have tangible, empirical evidence to believe that something exists, I do not. In this vast universe there are things (many things) that we humans will never be able to "scientifically prove". That does not make them any less real, it just means that we do not have the scientific capabilities to prove them. And yes, I am well aware that the burden of proof lies with the person making the claim, but even when proof cannot be obtained, that doesn't make the claim invalid. The 'ole "if science doesn't give us reason to believe in something, then no good reason exists" position is simply a false assumption, because absence of evidence does not equate to evidence of absence. Yes, by definition, God cannot be proven through empirical evidence, but the notion of a higher power is something that ties us to some of the earliest people and each other so it simply cannot be overlooked. So in response to your last sentence, if God cannot be disproven, there's no reason not to believe in God. M-Theory is really cool to just sit and think about, so I thought I'd throw my "for fun" examples in there :). Let me throw one more out there - one might say that the existence of universal invariant abstract entities (such as laws of logic, math and science) are proof of something transcendental. Others may say that this type of reasoning is nothing more than begging the question, but either way, complete understanding is not a necessary condition for understanding the existence of things.